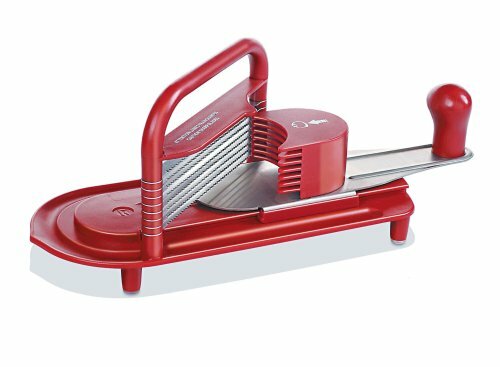 This small yet efficient tomato slicer is made of an ABS structure with serrated stainless steel blades, creating slices ¼" (5.5 mm) thick with each push. Non-slip feet are made of plastic. Works best with firm tomatoes. Dishwasher-safe. Cutter is made of an ABS structure and eight stainless steel blades. Blades create 1/4" slices; not adjustable. Non-slip feet are made of rubber. Works best with firm tomatoes. View More In Tomato Knives.